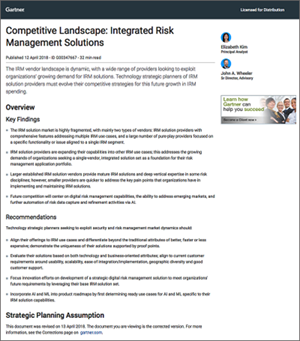 “Integrated risk management (IRM) solutions combine technology, processes and data that fulfill the objective of enabling the simplification, automation and integration of strategic, operational and IT risk management (ITRM) across an organization,” notes Gartner. Find out more about the IRM market and key solution providers. Take a look at this report from Gartner. Gartner Competitive Landscape: Integrated Risk Management Solutions, Analyst(s): Elizabeth Kim, John A. Wheeler, 12 April 2018.